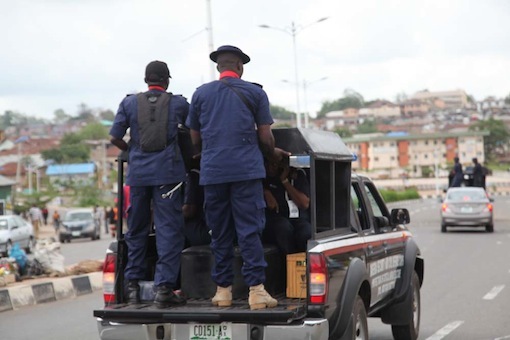 Operatives of the Nigerian Security and Civil Defence Corps (NSCDC), Kaduna State Command, on Tuesday arrested a fake soldier with Nigerian Army uniforms and Police beret in Kaduna metropolis. The Command’s Public Relations Officer, Orndiir Terzungwe, disclosed this in a press statement in Kaduna. NAN reports that the suspect identified as James Abelagi Tersoo, 25, was apprehended during a stop and search operations along Jos Road in Kaduna. The suspect, who claimed to be working with a private guard (name withheld), was heading to Kakuri area of the metropolis when he was arrested. “The operatives who escorted the suspect to his residence located at Jos Road during investigation, also recovered another pair of Army Camouflage uniform, two camouflage jungle hats, one pair of Army Uniform, one Army winter cap, one Army neck Muffler, two Army knee guard, one Army cardigan, two Army Crested T-Shirts and a pair of private guard uniform. measures put in place by government.